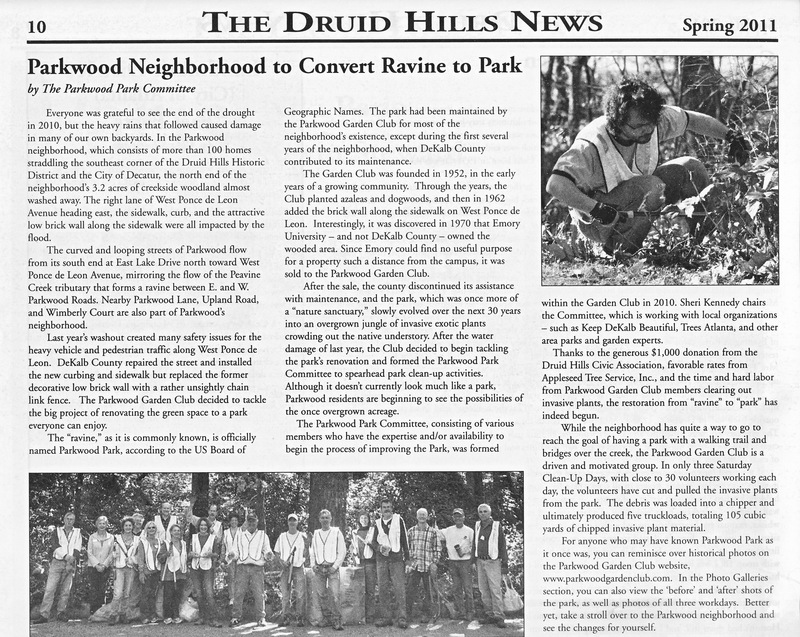 If you live in the Druid Hills part of Parkwood, then you may have gotten the Spring 2011 edition of The Druid Hills News (published by the Druid Hills Civic Association) in your mailbox a day or two ago. If you’re not sure, dig through this week’s mail to see if you have the hardcopy of the Parkwood Park Committee’s article that was published in it on page 10, complete with photos! Mary Angela Whyte, editor of the Druid Hills News, has given PGC permission to post a copy of the article here on our website (click on image above to enlarge) for those Parkwood residents who didn’t receive the newspaper in the mail. The article talks about the history of Parkwood Park and thanks the DHCA for their $1000 donation to fund our invasive plant removal. The Park Committee encourages you to read it and feel proud of our Park and what our neighborhood has accomplished so far with its restoration. Special thanks go out to all the members of the Park Committee as well as neighbors Susan Stewart and Geoff Seamans for their creative and editorial contributions to the article. We’d also like to thank Druid Hills News editor Mary Angela Whyte and any other staff who helped in getting our article into the Spring edition. This edition is not yet published on DHCA’s website, but when it is put online, you’ll be able to see it here. This entry was posted in DeKalb County, Parkwood Park, PGC in the media. Bookmark the permalink.